In 1924, the events were unfolding exceptionally well for De Caro sexteto, until the moment when both of their bandoneons decided to quit. Only one of them, Luis Petrucelli, actually did, nevertheless, De Caro brothers needed to quickly find the replacement. Among other potential candidates, Pedro Acosta was introduced to Julio De Caro, and when the latter heard the relatively unknown bandoneonista, he made an offer on the spot. Acosta was thrilled to play alongside his idol, but the perspective of being compared with famous Petrucelli was a horrifying one. But Julio De Caro already made up his mind. Firstly, he proposed frightened Acosta a few coaching lessons with him and his brother Francisco, and then, to make the matter even more flattering offered Acosta a new stage name – Pedro Laurenz. Laurenz was the name of the first husband of Acosta’s mother, to whom De Caro family was distantly related. Newly born Pedro Laurenz could not refuse. 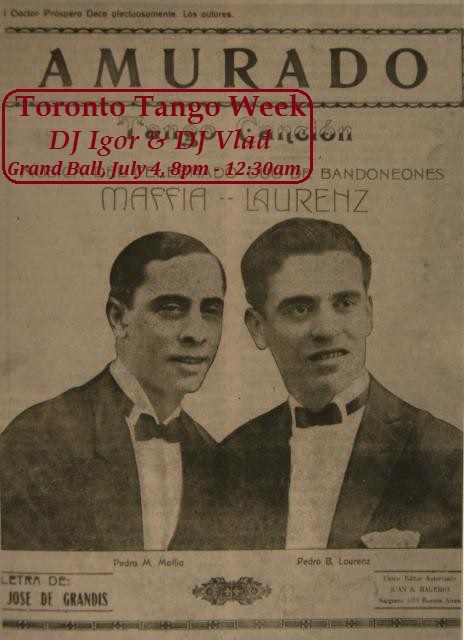 …As it turned out, there was a common trait between the two Pedro, besides the burning love to tango music… Either of them would rarely, if ever, smile… But on his way to meet Maffia, with the verses of “Amurado” in his bandoneon case, Laurenz almost laughed, remembering their first encounter of 1924… but now it was 1927, and Maffia already had his own sexteto, together with Elvino Vardaro, Cayetano Puglisi (see “The magic violin of Cayetano Puglisi“) and Osvaldo Pugliese. Pedro Maffia warmly greeted his friend, whom he did not see as often as before, when they were playing together. He calmly looked through the lyrics and the music that Laurenz wrote, and very soon the chorus part was ready, together with a masterful bandoneon variation not on his own, but on Pedro Laurenz theme. It was immediately picked up and recorded by Roberto Firpo, Francisco Lomuto, Carlos Gardel… to name just a few. Soon Julio De Caro recorded it with Pedro Laurenz playing his friend variations, and since then, “Amurado” remained Laurenz’ most favorite tango. Castellano lyrics with English translation by Paul Bottomer and even more recordings of this delightful tango can be found on the liner notes of the videos.